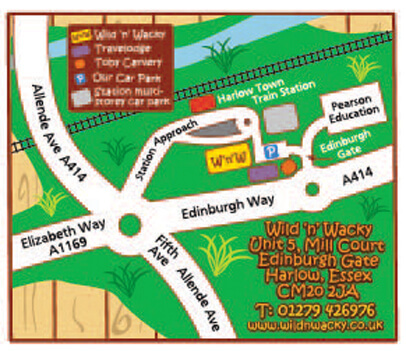 Wild 'n' Wacky is located between Station Approach and Edinburgh Gate, opposite the Harlow Town train station entrance. It is just off the main A414 in Harlow at Edinburgh Way and perfectly located if you are looking for fun days out for kids in Essex, Hertfordshire or North London. Customers can park for up to 3 hours in the Camera Controlled Burnt Mill Car Park, which we share with the Toby Carvery and Travelodge. 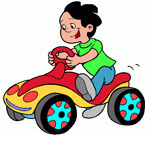 There is plenty of parking at the Pay & Display Harlow Town Train station multi-storey car park - just 30 seconds walk from Wild 'n' Wacky!" 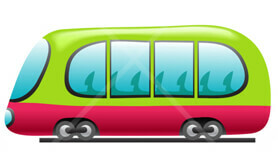 By Train : it couldn't be easier! Wild 'n' Wacky is directly opposite the Harlow Town British Rail Station which has direct links to London Liverpool Street, Stansted Airport & Cambridge. For train times -www.abelliogreateranglia.co.uk .If you are looking for soft play near North London, why not take the train. 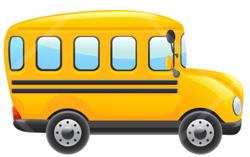 By Bus : Let the bus drop you here!The nearest bus stop is opposite our entrance at Harlow Town rail station, where Bus Route 10 stops, also Bus Routes 2,3,4 and 5 at peak times. Walking: It's free and good for you! If you are visiting Pets' Corner in the town we are a 3 minute walk or a 21 minute walk from Harlow Town Centre. Why not pop in.